Vitis coignetiae ‘Claret Cloak’ was found growing in a batch of seedlings of Vitis coignetiae during 1988 on our nurseries. The foliage was distinctly different from the species because of its young growth colouration and its more dissected foliage. The cut nature of the foliage disappeared as the seedling developed leaving the shape and size of the adult foliage similar to that of coignetiae. The rich colouration of the shoots and young foliage however stayed, and is one of the main attractions of the variety. We gave it the name 'Claret Cloak' due to the genus being associated with Viticulture and the word Claret being used to describe the red wine being produced in the Bordeaux region of France. Claret is also used to describe the colour 'Purplish-Red' which describes the new foliage colour admirably. The Cloak part of the name describes the habit and possible uses for the plant. Vitis ‘Claret Cloak’ flowers during May and June. The flowers are largely inconspicuous as they are hidden by the foliage. They do have a delicious scent which can be detected some distance from the plant and are a magnet to bees. Fruit is borne abundantly in bunches in the autumn during favourable seasons. The plant is an ornamental grape vine and although the fruit is not poisonous they are rather bitter to taste but could be used to make wine. The grapes are about one centimetre in diameter, round and purple with a bluish bloom. They also look attractive after the majority of the foliage has fallen. The adult leaves are olive green in colour and 15-20cm in diameter, three to five lobed with the apex pointed. They are quite thick and leathery. The shoots and young foliage are purplish red in colour and turn darker before ageing to green. The foliage turns rich scarlet in autumn and is another valuable feature. Vitis coignetiae ‘Claret Cloak’ is very easy to grow in any reasonably fertile soil in sun or part shade, but will need a support in order to establish. 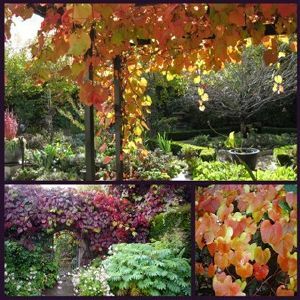 Uses: Vitis ‘Claret Cloak’ is vigorous and will provide extension growth of up to 2 metres in favourable conditions during a season. It needs support on which to climb and attaches itself as do all vines by means of tendrils. Trellis and wire fences are an ideal support for the plant The plant lends itself to covering unsightly fences and buildings and offers shade over pergolas. Another use is for adding attraction to an established tree where the autumn colour will enhance or extend the trees appeal.